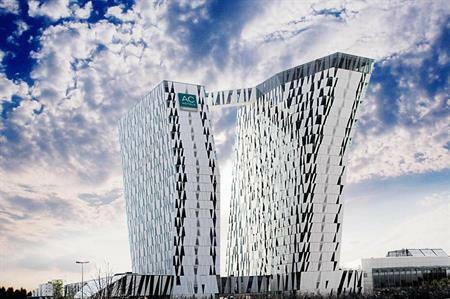 Marriott's 'lifestyle' brand AC Hotels has acquired the Bella Sky Hotel in Denmark, and relaunched it last month as AC Hotel Bella Sky Copenhagen. The 812-room property is located 10 minutes by metro from the city centre of Copenhagen and can also be reached by a free shuttle service from the airport. It features ‘dramatic’ modern architecture and interior design typical of the AC Hotels brand, which is aimed at ‘lifestyle orientated’ business travellers. The hotel has a range of guestrooms from standard rooms to suites, and has floor-to-ceiling windows throughout. It also offers large, flatscreen TVs, king-size beds, and free wi-fi. Meetings and events can be catered for in the conference area, which comprises of 48 meeting rooms with IT and A/V equipment. Direct access to the Bella Centre, Scandinavia’s largest conference centre, which has was expanded in November and can accommodate 30,000 delegates, is also available. The hotel has a range of dining options available including the Balcony Restaurant serving traditional Nordic fare, the Sky Bar and the Lobby Bar. There is also an aqua spa on site with hot and cold pools, rain showers and steam baths. This latest AC Hotels opening follows major global expansion of the brand, which recently opened its first US hotel in New Orleans and has also been expanding its footprint in Europe.